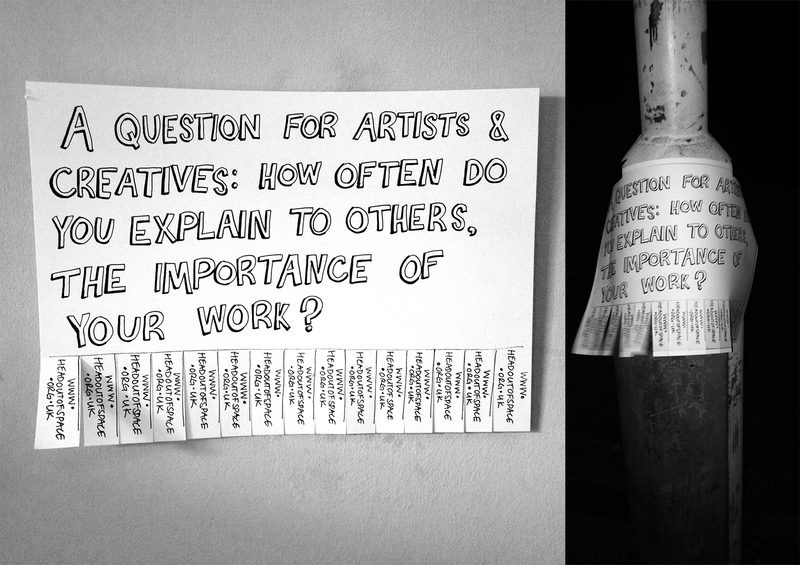 Questioning creative types of varying fields and expertise as to the significance of art in our lives, serves to unpick what has happened and what our futures might be with or without accessible art practices and spaces. The rate of greedy development across London has killed off many art spaces, fringe clubs, boltholes for local organisations and sites for cultural community activities, so that suburbs are changing way past what could have been deemed ‘comfortable regeneration’. What happens to the artists and makers? What becomes of a scene, when cultural providers disappear (how) do they reappear elsewhere? Finding available, affordable space requires a lot of research and often one has to adopt ways of making and sourcing space outside of conventional methods. For example, HOOS has been involved in activating public art interventions in open, public or ‘disused’ spaces. This also includes co-organising movable, home-based art salons as a result of difficulties in finding affordable spaces for group shows and artist talks. This isn’t anything new, amongst artists, but perhaps it is becoming much more common practice. The majority of artists don’t fit into a corporate business model and nor should they have to try to. Quantifying the ‘return’ on artistic practice is problematic because measuring outcomes requires a leap of faith for buy-in to long-term, future benefits and few developers have the patience and desire to invest this way. But Londoners’ ardent consumption of culture is proven over and again and when we’re not experiencing it through the city’s entertainment, we choose – or hope to – live in areas where cultural riches have become a highly tradable USP, as has been demonstrated in Brixton (and in Shoreditch, Hackney, Bermondsey…). A local Brixton creative, Julie, urged, “Brixton is now such a vibrant, creative area, so support those vibrant, creative people.” On this note, how much is being given back to creative communities by the people who choose to move to these areas, drawn by the idea of what culture can do for a house price? To date, HOOS interviewees have comprised artists, fashion designers, educators, urbanists, makers and musicians. Through HOOS we have discussed the importance of the presence of art throughout ones education, starting at early childhood; the value of art in peoples’ lives; the dilemma of sourcing space to be creative; long-term versus short-term studio acquisition and alternative spaces; the importance of planning urban areas with art as an integral component; art for mental well-being; art as a vehicle for activism; and more. HOOS will continue to search for solutions for finding space and raising an awareness of the value of artists, while calling into question why access to culture is not a given. This entry was posted in Blog on June 18, 2015 by Head Out Of Space.